“Hey, wait a minute Paste—didn’t you already publish your big best-of list for 2018? And didn’t that list contain superhero comics, kids comics, horror comics and sci-fi/fantasy comics, all under one big umbrella? What gives?” Well, intrepid Paste reader, you’re not wrong. Paste prides itself on taking as broad a look at the medium of comics as our small team can possibly manage. Our year-end rankings don’t discriminate between capes-and-tights adventures, creepy manga, bonkers webcomics or navel-gazing “literary” graphic novels, but when compiling our master list, we realized that 2018 was a deceptively great year for sequential art, and 25 notable books just didn’t cut it. Before the holidays roll around, we’ll be honoring books that excelled in the specific categories mentioned above. Some will overlap with our main list, but many won’t—and the way rankings shift around may surprise you. A title that stood out when viewed holistically might rank lower when assessed through a specific lens, and books that didn’t make the cut for the master list can easily come out on top of these individual breakdowns. If nothing else, we hope our newly expanded categories send you into 2019 with plenty of reading material. For this terrifying breakout list, we didn’t have a hard time defining the criteria (only one entry below could possibly stretch the definition of “horror”), but we did struggle to pick just 15 entries. 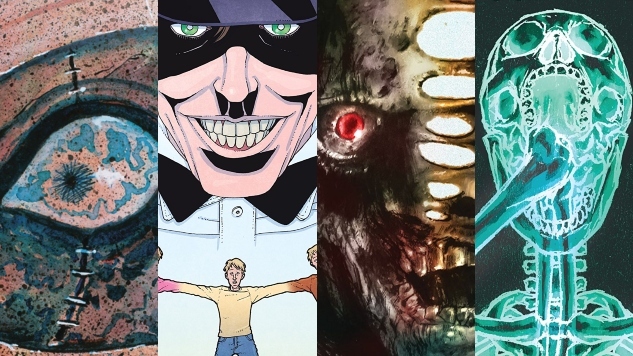 We’re big fans of the spooky side of sequential art, so it bodes well that filling out this list was such a bloody breeze—and we’re hopeful that 2019 has even more frights in store.